'Charlie Countryman' boasts a plot so preposterously reliant on coincidence it actually winds up being referenced by one of the film's main characters. Unfortunately, that kind of self-awareness doesn't lead to any further insight into the film, and, as it's the only instance of such, it winds up being like the rest of the plot: just another random moment thrown in for the sake of saying anything, really. It's the kind of faux-reflective cognizance that comes off more like a cynical wink towards the movie's inherent structural failings than it is an effort to express a deeper meaning or correlation between the incongruent events powering the narrative. At its heart, 'Charlie Countryman' is the kind of festival-ready pseudo-indie fare that eschews a coherent narrative structure for a mostly senseless decent into the daydream fantasy of yet another lost boy in search of the meaning of life through a girl who inexplicably "gets" him. Charlie (Shia LaBeouf) is like most white twentysomething males of independent cinema these days: He's a little sad, a little lonely, and he's mostly adrift. Following a conversation with his recently deceased mother (Melissa Leo), Charlie boards a plane for Bucharest, only to have the passenger sitting next to him (Ion Caramitru) die mid-flight, but not before making the world's weirdest comparison, by suggesting being a Cubs fan is somehow analogous to living under the oppression of a dictator. It sounds incredibly weird and it's fitting with the film's disjointed nature, so the audience is immediately on guard for something that strange to pay off down the line. The man also leaves Charlie with a mission to deliver a hat and a message to his daughter Gabi (Evan Rachel Wood), a cellist with a dangerous gangster for an ex played by Mads Mikkelsen, who was apparently brought on board to glare charismatically. Naturally, being a stranger in a strange land and having been thrust by equally strange circumstances into this fascinating young woman's life (did I mention she's a cellist? ), Charlie finds himself embroiled in a barely comprehensible skirmish between gangsters that later will also involve his two drug-addled hostel roommates played by James Buckley ('The Inbetweeners') and Rupert "Don't Call Me Weasley" Grint – who, between this and 'CBGB' is trying very hard to leave the 'Harry Potter' franchise in his rearview. Essentially a journey or quest movie with the visual aesthetic and heart of mid-'90s Danny Boyle beating just beneath the surface – there are plenty of thumping beats from the likes of Moby driving many of the more frenzied scenes – 'Charlie Countryman' certainly deserves some credit for its vitality and bottomless reserve of energy. All the liveliness in the world, though, isn't going to cobble together a compelling narrative from this collection of barely connected scenes that've been handed to director Fredrik Bond by screenwriter Matt Drake – who had a hand in the 2012 comedic misfire that was 'Project X.' Drake's screenplay is so busy lining up one event of Charlie's adventure in Bucharest to the next, it never bothers to find some kind of purpose in their connection. Again: this is a film that relies almost entirely on the magic of coincidence to justify the wildly circumstantial events that constitute its story. At a certain point, it becomes a question of what kind of movie 'Charlie Countryman' even wants to be. There's the solid – if tacky – romance between Charlie and Gabi that factors in LaBeouf's patented puppy-dog eyes at nearly every turn, but the film veers dangerously close into thriller territory whenever Mads Mikkelsen, and later, Til Schweiger menacingly erupt on screen. In these moments, there're elements reminiscent of 'Frantic' and other man-abroad-caught-in-terrible-circumstances action films, but the movie never runs with either long enough, or in a manner convincing enough, to justify belonging to either group. The story's general lack of focus reads as intentional, since Drake's script is like a Chicken McNugget: little more than a series of shallow scraps pounded together to resemble something palatable. The only trouble being: the second it's finished, the complete dearth of actual substance becomes far too noticeable. LaBeouf has certainly had his troubles as of late, and 'Charlie Countryman' isn't going to be doing him any real favors. For what it's worth, though, he's not the source of the blame in this instance, as his performance comes across somewhat earnest and only slightly smarmy, in that young-man-searching-for-artistic-relevance kind of way. In fact, the entire cast is equally fine in their performances (even Wood's Romanian accent is passable), which only serves to make this visually exaggerated aping of more purposefully stylish cinema feel like an overlong music video. 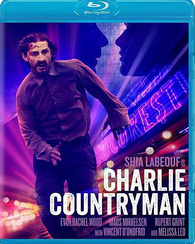 'Charlie Countryman' comes from Millennium Entertainment as a single 25GB Blu-ray disc in a standard keepcase. There are several previews ahead of the top menu, which can be skipped. Frankly, there's not much to choose from on the disc, aside from the film itself and two meager extras. At its heart, 'Charlie Countryman' is a stylish affair and the 1080p AVC/MPEG-4 encoded transfer does a fine job at bringing those ambitions to life. The image here is crisp and clean throughout; there is no evidence of any artifacts, noise, or other elements that might otherwise mar the image. The film takes on the typical cold, metallic look that always seems to signify Eastern Europe, but it manages to do so without the use of heavy filters, though there are times when those do come into play. This effect also augments the moments when the image leans more toward the warmer end of the spectrum, making the sudden shift seem deliberately conspicuous. Fine detail is constant throughout, and manifests even more during close-ups. Facial features and skintones alike are rendered superbly, giving the film a much-needed dose of reality. Textures are present everywhere, including the many darker scenes that have been filmed at night. In that regard, contrast levels are incredibly high. Blacks are a full-bodied affair that produces clean, well-defined edges that never bleed, or result in banding. Shadow delineation is equally strong, giving the image a full range on the darker spectrum that makes certain lighter, more vivid elements stand out. The Dolby TrueHD 5.1 mix offers a fairly standard listening experience that sounds a little low when it comes to dialogue, despite most of it being shuffled through the center channel speaker. For the most part, voices are clear and distinct, but noticeably softer than the rest of the mix. This generates a sense of imbalance between the dialogue and the other elements of the mix that keeps it from coalescing into a truly immersive listening experience. The mix offers good sound extension in terms of the thumping beats of the score and musical selections, which are driven primarily through the front speakers, but also appear in the rear channels as well. Sound effects are also spread out quite well, and benefit from some nice instances of imaging and directionality that flow with the frenzied camera work; through in some effective LFE, and a good portion of the mix sounds very nice. The problem, then, is how it all comes together, as the dialogue seems to be the runt of the litter, and is frequently overwhelmed by the power of the sound effects and especially the music. Provided the sound is at a high enough level, the actors' voices will be heard easily enough, but that requires some fiddling with the volume to find the sweet spot where dialogue is robust, and the rest of the mix isn't dominating every other element. Behind the Scenes (HD, 21 min.) – This is another standard behind-the-scenes look at the making of the film. While most of the interviews are typical fluff about how the actors first responded to the script, there is an interesting part that discusses how long this screenplay has been floating around – which might offer some insight into why it feels so dated in some places. Alternate Opening (HD, 2 min.) – Apparently, there was a version of the film that featured a voiceover by John Hurt. Mileage may vary, but Hurt's voiceover here helps give the film a dreamlike quality that would have assuaged many of the overblown elements and given them some structure in terms of how the film had intended to be interpreted. Alternate Ending (HD, 9 min.) – This is essentially the same ending, just with Hurt's voiceover wrapping up the pseudo-surreal storyline. The rest of the deleted scenes are short, inconsequential bits that are there for curiosity sake only. In many ways, 'Charlie Countryman' is about discovering the world for the first time, and how living in the moment is an experience many of us have in their twenties. The script, for what it's worth, feels very much the same: it is bursting with the kind of raw dialogue, exuberant structure, and hollow narrative that first time writers need to get out of their system before moving on to more meaningful, coherent work. Had the film recognized the youthfulness, as well as the emptiness inherent in its structure, it might've worked on some kind of meta level. Instead, this is just an exercise in banality, as everything the film presents has been seen before, and is usually delivered with more purpose. The disc does have a very nice picture that is slightly offset by average sound, and extras that seem to expose the film's flaws, so, for the curious, this one could make for a good rental.